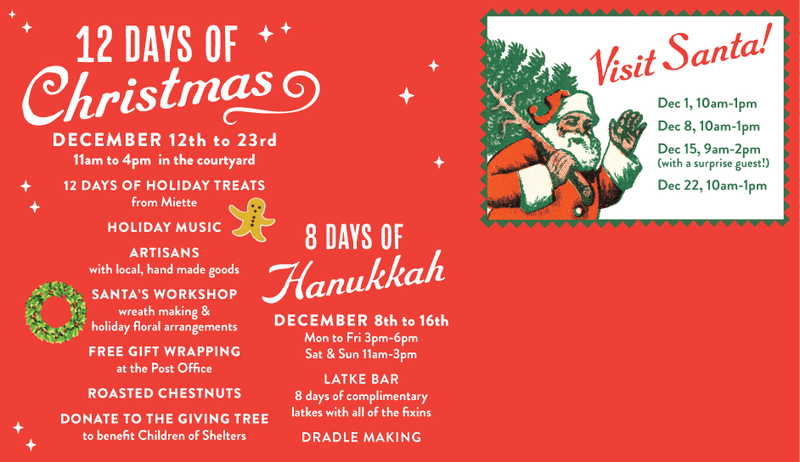 Become a Member of Marin Handmade! Our group events are member-initiated, and including trunk shows or boutique shows at local venues. We have a base of artisans who are active and very supportive of each other via the group forum, sharing resources, event opportunities and ideas. We are looking for more active active members! Growing our membership will also promote more action in our communities. To be an “active member” you will be invited to join our private membership group on FACEBOOK, where we share art and craft resources & ideas. If you choose not to join our Facebook Group, you will receive a semiannual newsletter. If you have news about your work or upcoming events, you are welcome to send a short story or post to us to promote on our blog or social networking pages, or you can share to our page on Facebook. 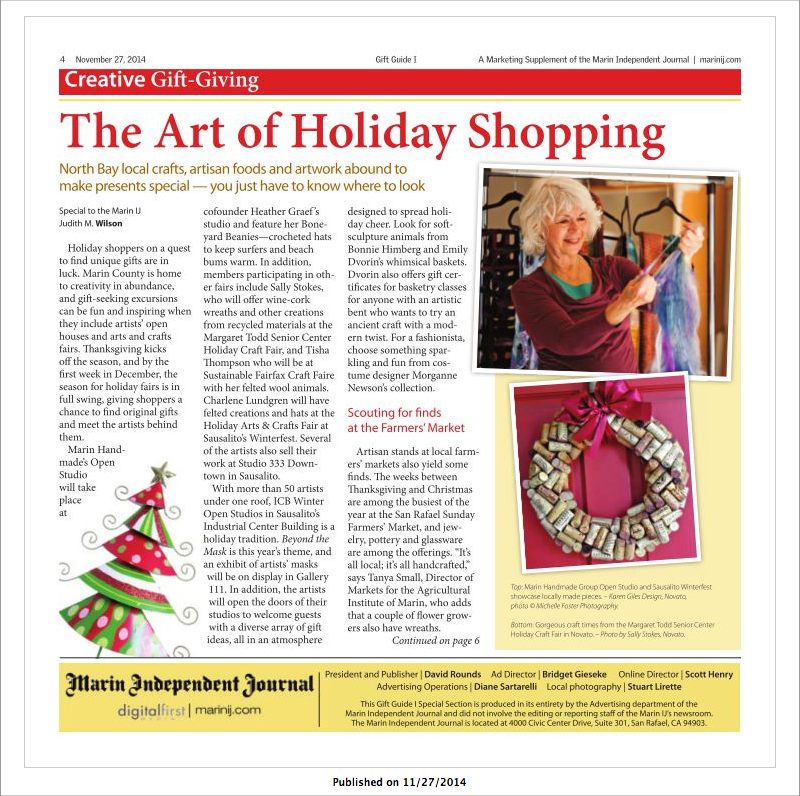 North Bay artisans interested in becoming an active member of Marin Handmade, can contact us via email. You will have the opportunity to be included in our interview series for new members on the blog. Please email 3 great photos representing your best work. 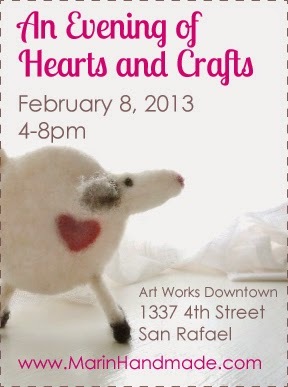 That’s right, Marin Handmade is celebrating Valentine’s Day with another festive evening at Art Works Downtown in San Rafael! Come by and meet some of our newest members, shop for your sweetie and do a crafty project to get you in the spirit of everyone’s favorite romantic holiday! Marin Handmade has been growing as we add new members to the collective. 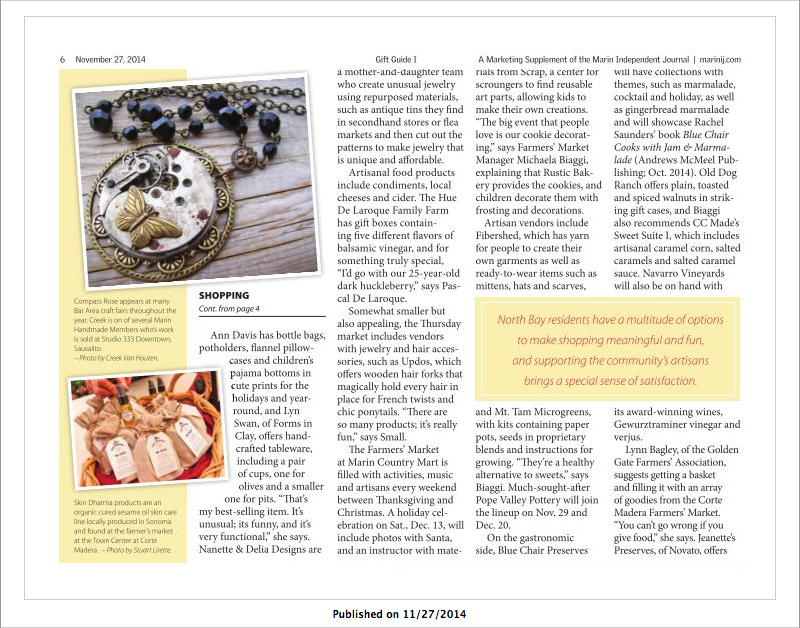 It is exciting to see such support for local handmade goods in the bay area. This Friday, December 14, we’ll be doing an exciting collaboration with the Marin History Museum, who has just opened a new museum shop in the plaza on 4th St. in downtown San Rafael. 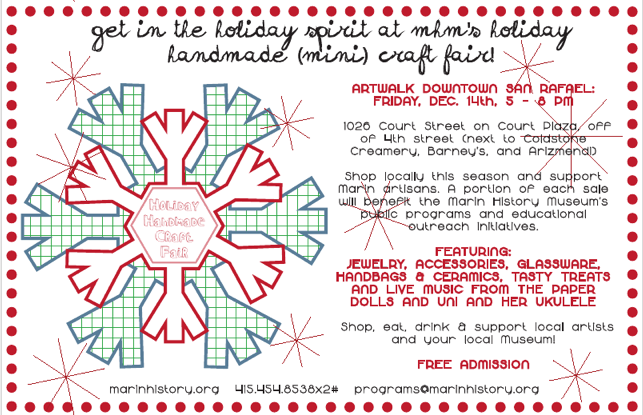 The Mini Holiday Craft Fair will coincide with the Friday Artwalk in Downtown San Rafael from 5-8pm. Come visit us at 1026 Court St off of 4th st. 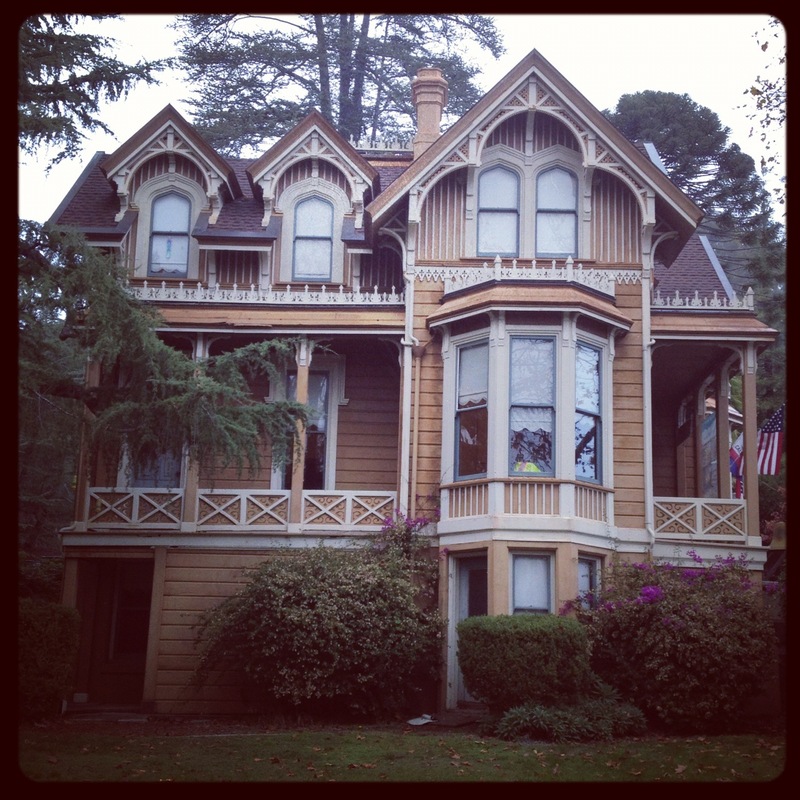 The Marin History Museum will continue to operate a rotating schedule exhibits from the beautiful Boyd Estate in San Rafael, a previous home of Arctic Explorer and adventurer Louise Arner Boyd. Stay tuned for Heirloom Craft Night at the Marin History Museum – we’ll be doing some collaborations in 2013 including the heirloom watch case locket workshop with Compass Rose Design Jewelry.